NEW YORK, NY. — New York All-Star Forward Carmelo Anthony will be on hand for basketball instruction and fun at the 2014 Citi Carmelo Anthony Basketball ProCamp. Location: Baruch College, New York, New York. Date: Sept. 13, 2014. Session 1 Time: 10:00 AM to 1:00 PM for boys and girls grades 1 – 5. Session 2 Time: 2:00 PM to 5:00 PM for boys and girls grades 6 – 12. Cost: $249. Limit: 200 campers per session. Source: Procamps.com. 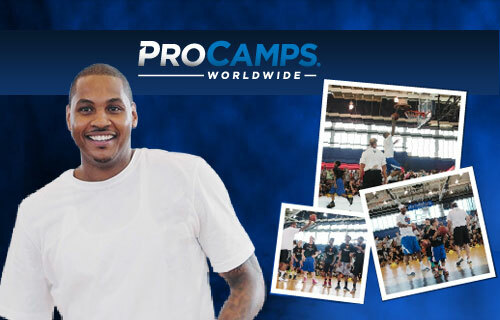 Photo shows New York Knicks All-Star Forward, Anthony Carmelo, appearing at 2014 ProCamp. Campers will experience various stations, specializing in fundamental skills of basketball. Individual groups will be small to ensure that each camper gets maximum instruction. Each camper will be placed on a team according to his or her age. Carmelo Anthony will give talks highlighting the finer points of the game of basketball and beyond. Parents and guests will be able to listen to camp guests in designated areas at each location. Carmelo Anthony currently plays for the New York Knicks. Since entering the NBA, Anthony has emerged as one of the most well-known and popular players in the league. He was named to the All-Rookie team, to the All-Star team six times and to the All-NBA team six times. If you would like to book Carmelo Anthony for a speaking engagement or appearance, contact Carmelo Anthony’s booking agent for speaker fees. For booking agent and appearance fee information on how to hire New York Knicks players for appearances, call 1.855.303.5450.